Rediff.com » News » Play the Game! Check out our Election Sentimeter! How many seats would the BJP-led National Democratic Alliance have won had they fought the 2014 elections with their current alliance partners? Our RediffLabs team has devised an Election Sentimeter to show how the swing in votes affects the election outcome. 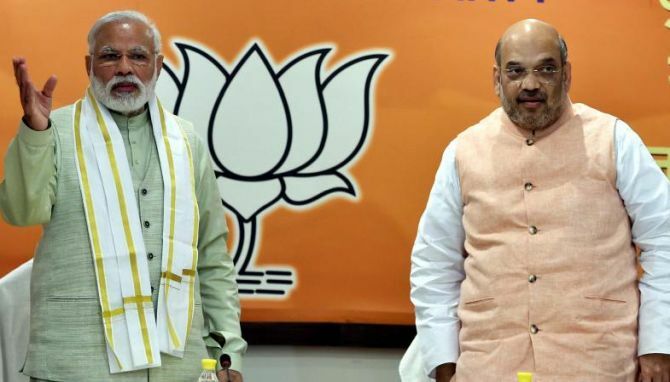 Ahead of the 2019 Lok Sabha polls, the Bharatiya Janata Party has firmed up alliances in several key states. Whether it is Tamil Nadu or Bihar, the saffron party is far ahead of its main rival, the Congress, in stitching crucial alliances for an election where every single percentage point of votes brought in by small partners can have significant bearing on the final results. The main opposition party has been squeezed out of Uttar Pradesh by the Samajwadi Party-Bahujan Samaj Party gathbandhan (alliance), which may help the BJP in the politically most crucial state where a swing of few percentage of votes can take the poll pendulum to the other side. In this scenario, how many seats would the BJP-led National Democratic Alliance have won had they fought the 2014 elections with their current alliance partners? Rediff Labs analysed the 2014 Lok Sabha election results to develop a Sentiment Meter for the 2019 electoral battle. A mathematical model is used to calculate how many votes the NDA will get with its alliance partners if the sentiment/percentage is altered. Based on the change, each constituency is marked with the winning group -- NDA or UPA. Move the pointer on the Sentiment Meter to see how the swing will affect each and every group. BSP or SP: Who will benefit more from alliance?